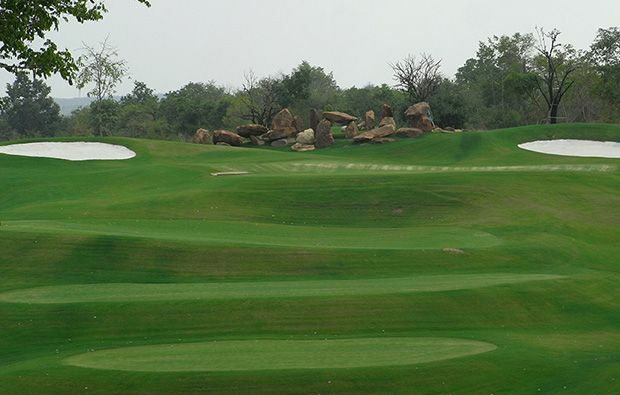 Some of the more interesting holes on the Creek Course include the par-3, second – quite a short hole by modern standards as you tee off from an elevated position with great view of the surrounding countryside Trees line both side and also partially obstruct your view of the green which is fronted by a huge rock-filled gully – not much room for error here as you are either on the green or in the trees but at least there are no bunkers. The par-4, fourth is another tough hole demanding a long carry over a large waste area to reach the fairway and a large bunker occupies the entire width of the fairway as you approach the green. 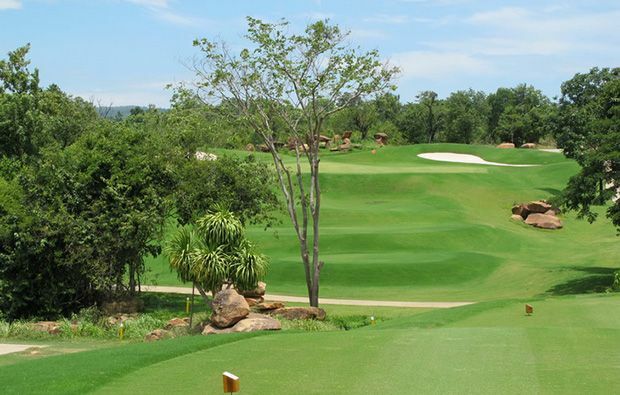 The seventh hole which is another par-4 requires a solid drive and correct positioning as the approach over a creek to a raised green with a tree partially blocking your view will fill you full of doubts. On the Valley Course the par-3, third hole you tee off from raised tee boxes over some rocks to a triangular-shapes green protected by a large bunker on the left and a tree in front of the bunker just to the right of the green. The par-5, fourth is arguably the most difficult hole on the course as you aim for the very narrow landing area protected by a line of bunkers along the left and trees on the right. If you are not a long hitter you will probably be faced with a blind second across the dogleg as the hole turns right. 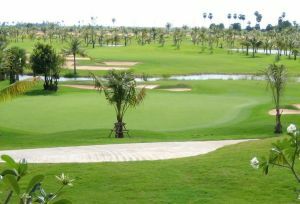 The approach is to a table-top green with bunkers either side – if you run off the back you will disappear into deep rough. The par-3, seventh is going to cause nightmares for high handicappers. 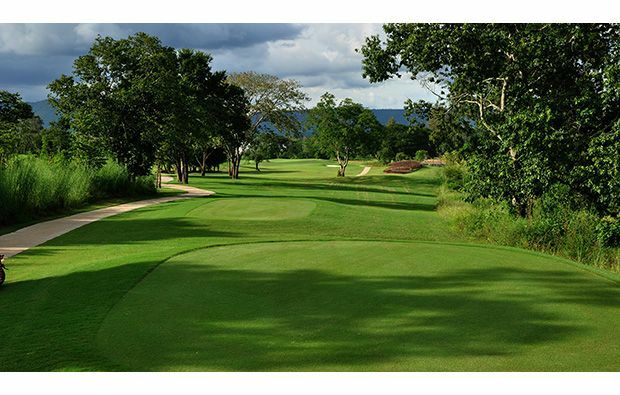 You play from elevated to boxes to an island green – which during the dry season is not always surrounded by water but the thick vegetation is just as bad. 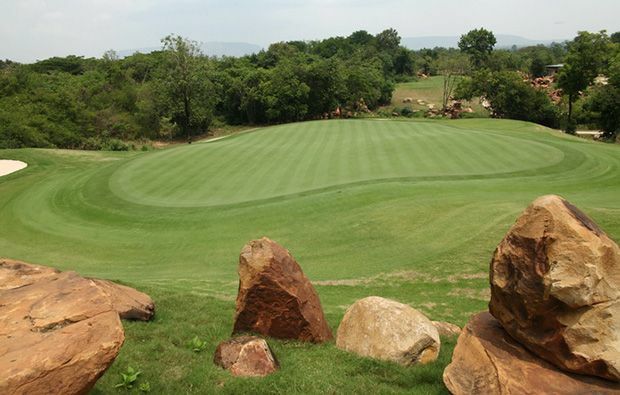 The green is not that large and there are no bail-out areas – basically you will either be putting for a birdie or playing form the drop zone! As I mentioned previously Seve has left his mark on the par-3, third in the guise of the large bunker in the shape of an S. The target is quite small with a patch of rocks guarding the front-left of the green and two more bunkers either side. Short and right and you will end up in Seve’s bunker – go long and you could finish in the trees behind the green. 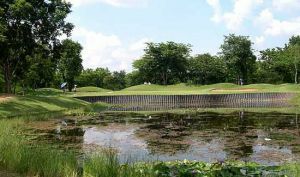 The seventh is another very difficult par-3 with a narrow and undulating green with a small pond and five bunkers surrounding the green. Lots of trouble over the back as well so this looks like a real potential card-wrecker. The resort has plenty of other facilities including a five-star hotel, spa, sauna and massage room and swimming pool. The courses is usually pretty empty midweek so you should not have any trouble securing a tee times and Golfsavers can make it even easier for you to book online. 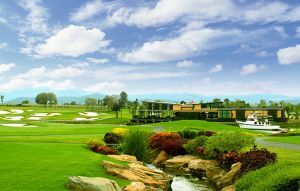 Mountain Creek Golf Resort has different Services to offer. Choose a date and number or players to see the rates.